Glenn McCullough, Jr., executive director of the Mississippi Development Authority (MDA), has his finger on the pulse of economic development in the state of Mississippi. A man with definitive ideas, plans, goals, and a vision for both the businesses and the people of the state, McCullough emphasizes that the recent achievements of the MDA result from his team and their partners’ shared interest in Mississippi’s success. When we sat down with McCullough last fall, he noted that his priorities for the MDA included excellent performance in economic development, departmental accountability, and clear communication and collaboration with partners. Over the past few months, the MDA has put these plans into action, fostering an unprecedented spike in economic development, as well as the expansion of initiatives such as OneMississippi and Mississippi Works. Though we are barely past the midpoint of 2016, it has already been a historic year for economic development in Mississippi. On February 8 of this year, the state acquired two massive development projects. Edison Chouest Offshore’s TopShip, LLC announced a $68 million inland port investment at the Port of Gulfport. Their presence will mean approximately 1,000 additional Mississippians will have jobs building ships once the project reaches completion. 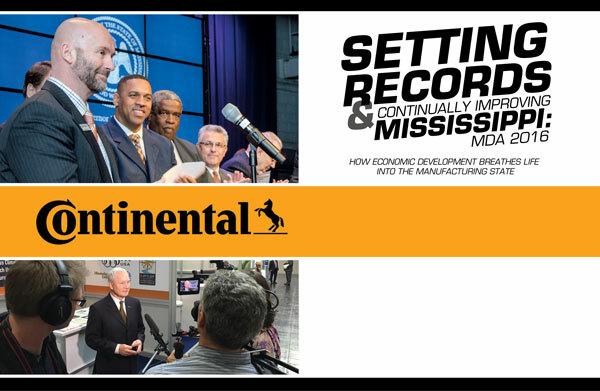 Later the same day, Continental Tire released plans for a $1.45 billion investment to build a production plant on the Industrial Drive in Clinton. 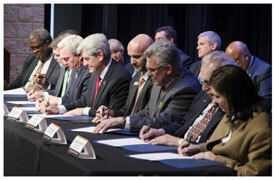 This plant, once completed, will employ 2,500 Mississippians. This news set a record for the greatest capital investment and projected job creation for the state in a single day — totaling $1.518 billion and 3,500 new jobs. The average salary for the 3,500 newly created jobs will be $40,000 annually, which is nearly double the average per capita income for jobs in Mississippi today. Both of these major capital investments are in the manufacturing sector, as are nearly 80% of all MDA supported projects. Several other significant developments in and/or involving the MDA are currently underway as well. These include the submission to the Mississippi legislature of a performance-based budget for 2016, as well as the establishment of an internal “winning performance” scorecard, both of which are designed to assess the performance of the MDA based on quantifiable results. In 2016, Mississippi became the first state to submit a comprehensive workforce development plan to the U.S. Department of Labor, with the goal of continuing to improve our workforce, one of the state’s greatest selling points when companies consider locating to or expanding in Mississippi. Although 2016 has already been a record-breaking year for economic development in Mississippi, MDA and its partners have no plans to rest or to bask in their accomplishments. New goals and opportunities await. The overarching objective is specific and clear: doing everything possible to achieve a higher level of agency performance, which results in stronger economic development for the state and ultimately benefits the people of Mississippi. Continuing to grow international interest in investment in Mississippi also ranks high on the to-do list for the MDA in 2016. 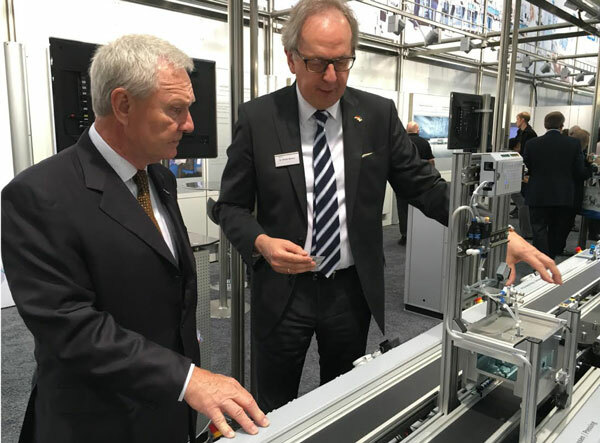 The Hannover Messe 2016 in April of this year was a huge event for the MDA and its partners. The delegation, including representatives of four companies and three economic developers, participated in 19 trade meetings. 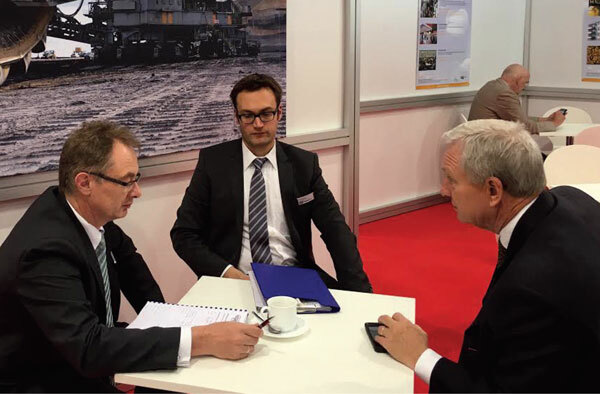 Hannover Messe is the world’s largest industrial fair, and in addition to the United States being this year’s guest of honor, Mississippi had a booth and a strong delegation at the Messe. The Mississippi Development Authority’s focus is precise — People, Process, Product.